JUST IN TIME FOR CHRISTMAS – NOW YOU CAN TAKE YOUR RIVER AND YOUR CRIBBAGE GAME WITH YOU! Our River Map Cribbage Board Boxes are HANDCRAFTED with the same quality and detail as our River Map Fly Boxes. And like our Fly Boxes, you get to Choose Your River Map, Your Artwork, plus add Names and Inscriptions because at Stonefly Studio, “We believe life should be personal!” WHY GIVE AN ORDINARY GIFT WHEN YOU CAN GIVE AN EXTRA ORDINARY PERSONALIZED GIFT? 100’s of Stonefly Studio Original River Maps to Choose From. Our Custom Designed, Laser Engraved RIVER MAP CRIBBAGE BOARD CARD BOXES are HANDCRAFTED from handpicked boards of Beech, Cherry, Mahogany, Maple, or Walnut Wood. Each Box includes a Cribbage Board and one of our Original Stonefly Studio River Maps engraved on the front. Engraved on the back is your Choice of Fish or Wildlife Artwork plus a Name and Inscription. Cribbage Board Card Boxes include 4 quality metal cribbage pegs. Hidden barrel hinges add to the beauty of the box, and a strong magnetic closure assures those cribbage pegs won’t escape! Our Cribbage Boxes are the same size as our Fly Boxes which make them perfect for travel. Just toss them in the backpack and go. Cards are not included. PERSONALIZATION IS FREE!! No character limit. Copyright (C) 2015-2018 Stonefly Studio All Rights Reserved. ← DON’T WAIT FOR CHRISTMAS!!! 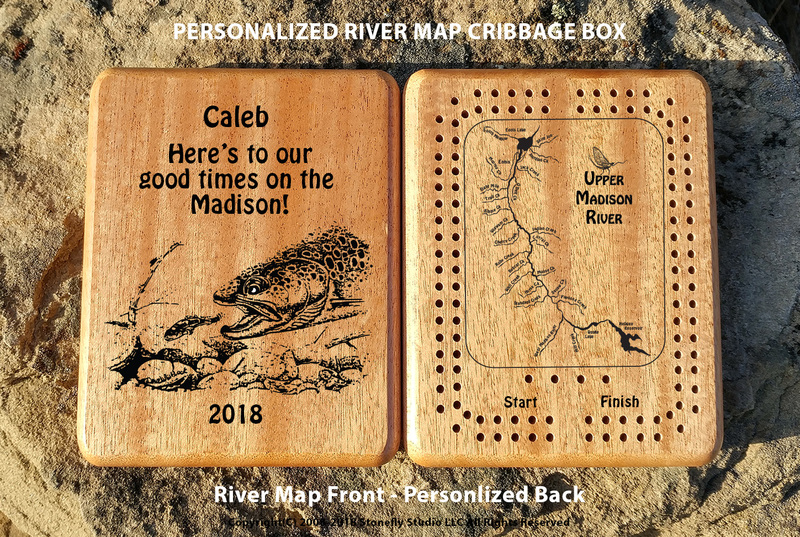 RIVER MAP CRIBBAGE BOARDS ON SALE OCT. 4 – 15, 2018.